Like American Jews themselves, America's rabbis were divided on the issues of slavery and secession. Rabbi George Jacobs of Richmond rented slaves for household work. His fellow townsman, the Reverend J. M. Michelbacher, believed slavery was ordained by God, sentiments shared by colleagues Simon Tuska of Memphis and James K. Gutheim of New Orleans. The rabbinic "hero" of the pro-slavery forces was Morris J. Raphall of New York who declared that though he himself did not favor slavery, the Bible did not prohibit it; indeed, biblical law guaranteed the right to own slaves. Rabbis Sabato Morais of Philadelphia, Bernhard Felsenthal of Chicago, and especially David Einhorn of Baltimore inveighed against slavery. Einhorn called it "a deed of Amalek, a rebellion against God"; Felsenthal hailed abolition, remarking, "should not the nation rejoice ... The white people have become emancipated just as well as the black." Three published sermons in the Library's holdings present some of the gamut of views. Rabbi of B'nai Jeshurun, New York's first Ashkenazi congregation, Morris J. Raphall had distinguished careers in England and America as rabbi, author, editor, and gifted orator. But he is most remembered for one sermon he preached on the eve of the Civil War, Bible View of Slavery, which was published and republished and widely distributed by the pro-slavery forces. Though he himself opposed slavery he argued that the Bible permitted it-and became stamped as the pro-slavery rabbi. His portrait was published by P. Haas, long before, in 1850. M. J. Raphall, Engraved Portrait, New York, 1850. Prints and Photographs Division. The result to which the Bible view of slavery leads us is-1st, that slavery has existed since earliest times, Bud, that slaveholding is no sin, and that slave property is expressly placed under the protection of the Ten Commandments; 3d, that the slave is a person, and has rights not conflicting with the lawful exercise of the rights of his owner. A religion which exhorts to spare the mother from the bird's nest, cannot consent to the hear-trending spectacle of robbing a human mother of her child ... Thus crumbles into a thousand fragments the rickety structure of Dr. Raphall ... To proclaim in the name of Judaism, that God has consecrated the institution of slavery! Such a shame and reproach the Jewish religious press is in duty bound to disown and to disavow, if both are not to be stigmatized forever. If a Christian clergyman in Europe had delivered a sermon like that of Dr. Raphall, all the Jewish orthodox and reform pens would have immediately been set to work ... to repel such a foul charge, and to inveigh against this desecration of God's holy name. Why should we, in America, keep silence when a Jewish preacher plays such pranks? The Rev. Dr. M.J Raphall's Bible View of Slavery. New York: Thalmessinger, Cahn and Benedicks, printers, 1861. 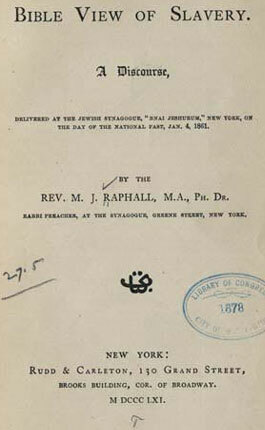 Bible View of Slavery: A Discourse, Delivered at the Jewish Synagogue, B'nai Jeshurun, New York, on the Day of the National Fast, January 4, 1861. New York: Rudd and Carleton, 1861. 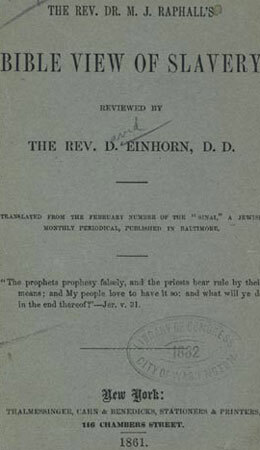 Dr. Einhorn preached this sermon and published it in his German-language periodical Sinai in pro-Confederate Baltimore. The man-servants and the maid-servants Thou has given unto us ... the enemy are attempting to seduce, that they too may turn against us, whom Thou hast appointed over them as instructors in Thy wise dispensation! We believe, O God, that piety cannot subsist apart from patriotism-we love our country, because Thou has given it unto us as a blessing and a heritage for our children ... bring salvation to the Confederate States of America. On the Day of Prayer, recommended by the president of the C.S.A. March 27, 1863, the Rev. 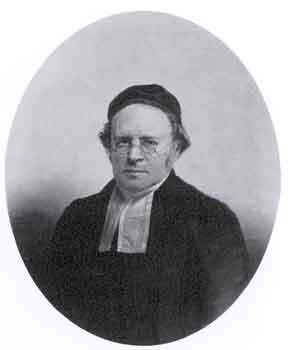 M. J. Michelbacher, of the German synagogue Bayth Ahabah, preached this sermon, "to which he added a prayer for the Confederate States of America "to crown our independence with lasting honor and prosperity," and for its president, Jefferson Davis, "grant speedy success to his endeavors to free our country from the presence of its foes." Presentation copy to Dr. J(ames) Beale. 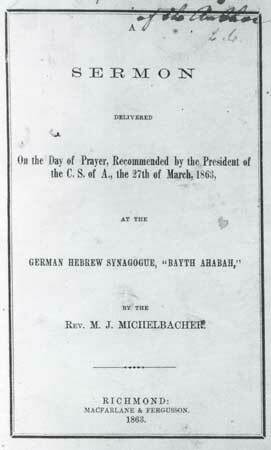 M. J. Michelbacher, A Sermon Delivered ... at ... "Bayth Ahabah" (House of Love), Richmond, 1863. Rare Book and Special Collections Division. Sources: Abraham J. Karp, From the Ends of the Earth: Judaic Treasures of the Library of Congress, (DC: Library of Congress, 1991).